With the many stresses of military life, decorating your bedroom can create a haven that is uniquely you. If you choose to rent, however, creating that restful space presents its own challenge. I’ve rounded up some of my favorite Pinterest finds for creating just what you need- without painting the walls! Let’s be honest- the centerpiece of the bedroom is, well, the bed. Why not go for a statement piece with one of these truly impressive DIY headboards!? Soft? Bold colors? There are so many varieties to choose from! 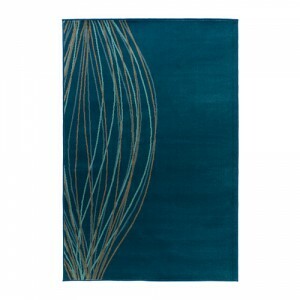 Go for maximum impact from the first step into the room with an area rug like this one from Ikea. Make the most of your bedroom windows by draping the walls in fabulous fabrics. Expanding the wall hangings adds texture and creates the illusion that your bedroom is lit by a bank of windows! Need to brighten a small space in your bedroom, like a reading nook or small desk? 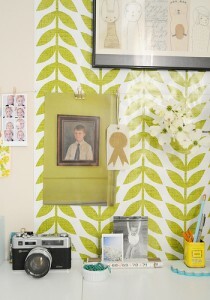 Wrapping paper offers an inexpensive and easy to change way to bring a pop of color to the walls! It is too easy to get caught in the trap of thinking “I won’t be here long enough to really make it my own.” Even if you are only at an assignment for a short time, take a weekend and personalize your space. Throw pillows in your favorite colors, some art or photographs on the wall, and little touches from home can go a long way towards creating a spot that is uniquely you. Check out AHRN.com’s Pinterest boards for even more ideas! How would you decorate your bedroom in your dream home?